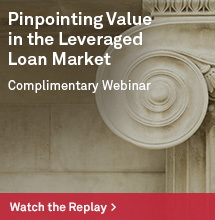 Getting Grim For Gold Miners? If you are worried that gold prices are falling, the prognosis could be much worse for gold miner stocks. Although many investors believe the performance of gold miners is just like the performance of gold, this is not quite the case. 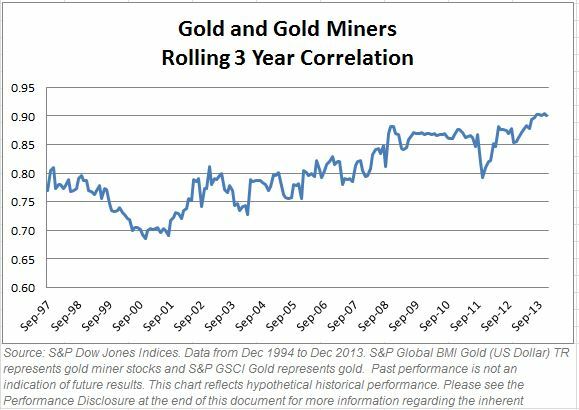 If investors look at correlations alone to determine they are getting their gold exposure through gold miner stocks, they are missing a big part of the picture. 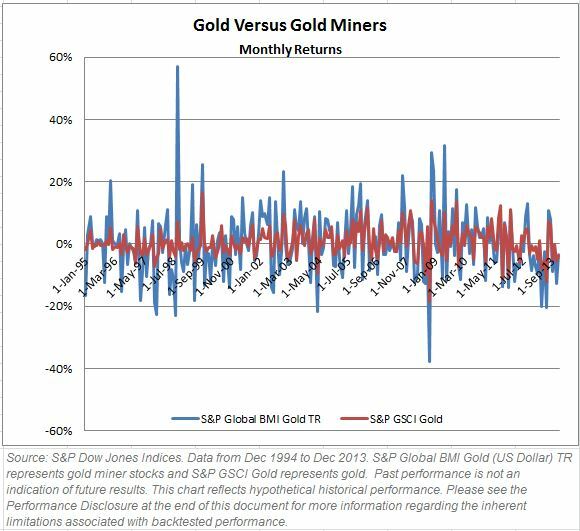 The historical correlation of monthly returns between the S&P GSCI Gold (gold) and the S&P Global BMI Gold (gold miner stocks) from Jan 1995-Dec 2013 was 0.78, though it has ranged from 0.68 to 0.90 when looking at 3-year rolling periods and it is at its highest now. So when analyzing the relationship between gold and gold miner stocks, from that perspective, it looks strong – but is potentially deceptive. 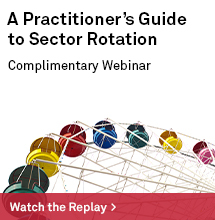 There are influences on gold miner stocks that are less related to gold. 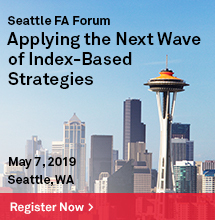 Generally the management of the companies aims to maximize shareholder value where decisions may be in or out of line with the gold price. For example, decisions on dividends, debt/equity ratios, hedging out the price of gold or switching the metal they are actually mining may drive the stock price. Sometimes even stocks that are classified as gold miners may have a greater percentage of revenue coming from other metals. 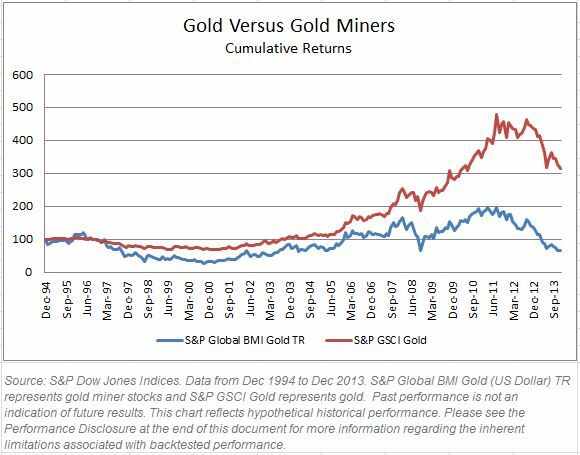 During the aforementioned period (Jan 1995-Dec 2013,) the S&P GSCI Gold returned 212.8% versus a loss for the S&P Global BMI Gold of 36.1%. Why is this? The losses of the gold miners are so much bigger in the negative years for gold and not as positive in the positive years for gold. 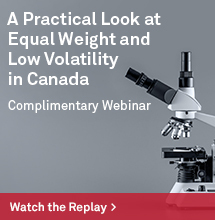 On average when gold lost in a year, it lost 12.1%, while gold miner stocks lost 27.7%. When gold gained in a year, on average it returned 14.4% but gold miner stocks were only up 12.8%. Also, the annualized volatility of the gold miner stocks is 37.1%, double that of gold at 16.7%. 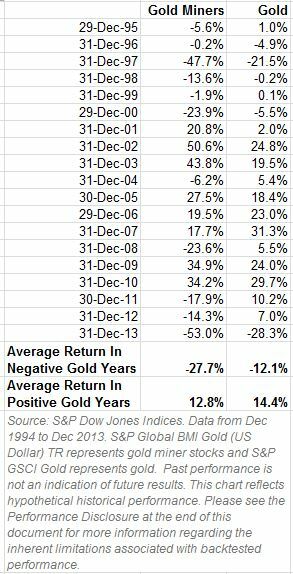 Although there have been years with positive gold returns and negative gold miner stock returns, there has never been a negative year for gold with a positive gold miner stock return. So, a falling gold price could be a bad sign for the gold miners.